As the old saw goes, birds of a feather flock together—and more often than not, those birds resemble one another, versus birds that live in a faraway place. Scientists are learning, though, exactly how birds in different locations are similar across species. A new study in the Proceedings of the Royal Society B posits that differences in wing shape and size synch up where with birds live. Specifically, birds that live year-round in tropical regions, especially those which spend most of their days in dense forests, tend to have shorter, rounder wings, whereas birds that migrate long distance to and from more temperate climates or favor oceanic islands often bear longer, pointier wings. 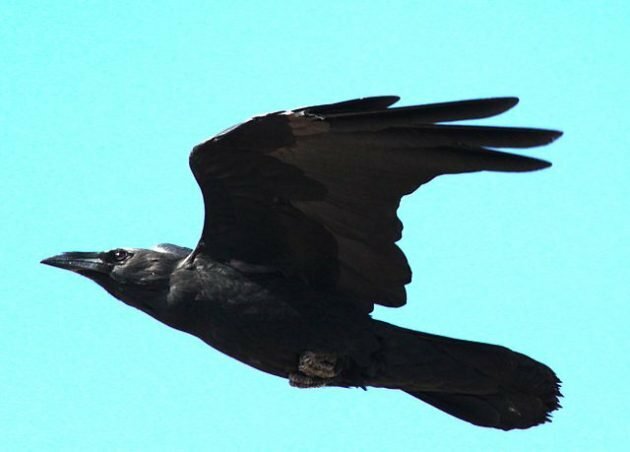 The researchers focused on Corvides, including jays, crows, and ravens (like the Common Raven captured in flight by Khyri via Wikimedia Commons). By looking at 782 species of Corvids from across the globe, they were able to ascertain patterns in wing size and shape that varied by the birds’ habitat and migratory habits (or lack thereof). The commonalities appear related to dispersal, but not necessarily to diversification. Scientists hope the findings can hope them better understand which traits, such as dispersal, increase species’ potential for invasiveness.